Turkey’s Defense Ministry announced on Wednesday that a total of 233 members of the military have been expelled from their posts in the Turkish Armed Forces (TSK) due to their alleged links to the based-faith Gülen movement, which is accused by the Turkish government of masterminding a failed coup attempt on July 15. Out of the 233 expelled military members, 158 of them are officers, 67 are noncommissioned officers and eight are specialized sergeants; 201 of them are from the air forces command and 32 are from the naval forces command, according to the Defense Ministry statement. 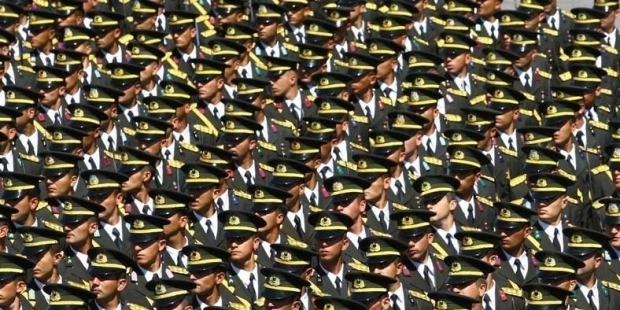 The number of military members expelled from the TSK since the failed coup attempt has reached 3,939 with the latest expulsions. This article originally appeared in Turkish Minute on October 12.